Sigourney Weaver returns as Lt. Ripley in this action-packed sequel to Alien. 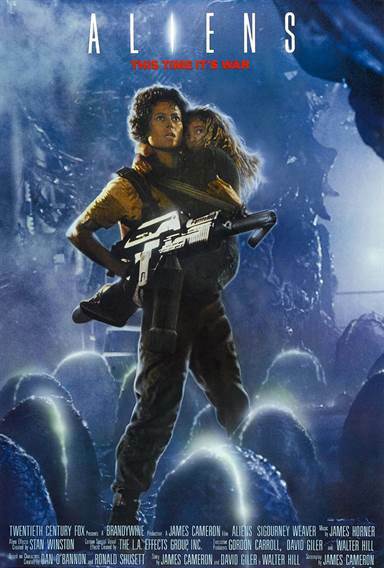 The only survivor from the first film, Ripley finds her horrific account of the alien and her crew's fate is met with skepticism -- until the mysterious disappearance of colonists on LV-426 prompts a team of high-tech Marines to investigate. Also features a commentary by cast and crew members and both the theatrical and special edition versions of the film. Download Aliens in Digital HD from the iTunes store. Aliens images are © 20th Century Fox. All Rights Reserved. Aliens Blu-ray 30th Anniversary Edition features outer space and Sigourney Weaver and makes for one of the best sci-fi movies ever. Can you believe it's been 30 years since Sigourney Weaver graced the movie theaters as Ellen Ripley, the sole survivor of her ship after the catastrophic encounter with the Alien? Who else can pull off outer space escapades, slime, and keeping a cat in a space station? Sigourney Weaver is brilliant in this Rip Van Winkle-esque story where Ripley wakes after a 57 year nap (yet she doesn't look a day over 29). One of the earliest opening scenes draws me in – watching Sigourney found by the salvage team under a sheet of what appears to be plastic with her cat, Jonesy, next to her. From the very beginning, Director James Cameron sets up what will be one of the most epic sequels to a sci-fi movie ever. But just keep watching- Cameron is known for switching gears in film, and, does so beautifully, in Aliens. 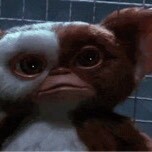 Haunted by nightmares, Ripley is convinced to return to LV-426 to save the humans who now inhabit the aliens' planet. Differences between Ripley and the crew arise as she's clearly seen as the "new" person and Ripley needs to get used to how things are done on this mission. Mothering instincts are awakened in Ripley, just as we also see the survival instincts kick in that have been ever present in her character. 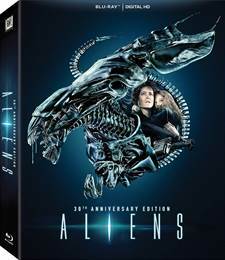 The Blu-ray transfer is the exact same one that was in the Alien Anthology release from a couple of years ago, so if you are expecting a different viewing experience than before you will be somewhat disappointed. Of course that isn't to say the quality is bad as the video is still presented in 1080p High Definition with an aspect ratio of 1.85:1. The blacks are well defined and the picture is sharp (for a film that was originally released in 1986). The audio is DST-HD Master audio 5.1, so every explosion and scream is clear with a decibel range that spans most of the spectrum. Watching the Blu-ray in surround sound is a unique experience that hopefully most viewers will be able to enjoy. Aside from the list of special features below that were also released as part of the Alien Anthology Edition, Aliens 30th Anniversary Limited-Edition release also features a 30 minute talk with director James Cameron that is only available online at FoxExtras.com , as well as an illustrated comic book and postcards with some original artwork from the film. • Audio Commentary with Director James Cameron, Producer Gale Anne Hurd, Alien Effects Creator Stan Winston, Visual Effects Supervisors Robert Skotak and Dennis Skotak, Miniature Effects Supervisor Pat McClung, Actors Michael Biehn, Bill Paxton, Lance Henriksen, Jenette Goldstein, Carrie Henn, and Christopher Henn. If you are an Aliens fan, you most likely already own this film as part of the Alien Anthology release or one of the other editions that have been released through the years. While the online talk with James Cameron and the physical extras are a nice touch, it might not be worthwhile for you to double-dip and purchase this version. However, if you are just the casual Aliens fan, or have never owned the film, there couldn't be a more perfect time for you to purchase it. Just be sure to be on the lookout down the road for the 4K UHD version, which will be a must buy for all. Liquid-powered military grade flamethorwers were used on set during the filming.